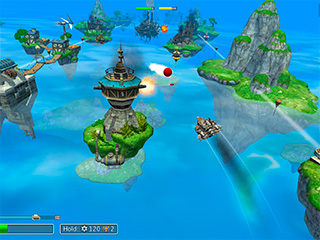 Join the Windopolis air force and take on epic battles in the heavenlies in Sky to Fly: Faster Than Wind 3D Premium. It i new game from Absolutist Ltd. This time it is not match-three or hidden object game. It is a battlefield shooter! Sky to Fly has a really cool steam punk style to it. If you are a fan of flying planes and having to dodge enemy weaponry as you blast pirates and monsters out of the sky, then this is definitely the game for you. As a captain of a delivery ship who happens to get wrapped up in a conspiracy, you will get to build up your fleet with a wide selection of leaders and pilots that will help you take on the challenges in this cute story plot. 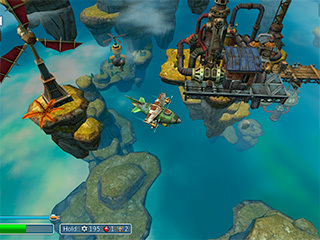 Sky to Fly has a really cool steam punk style to it. Steam punk as a genre is basically an alternate history, in which the steam engine technology of the Wild West is still used today or in the future. Instead of having aircraft that are based on modern designs, everything is a little surreal. There are floating islands that are linked together to form civilizations in the sky and you get to fly around them. Your warship is a little bulky, but good enough to blow up space pirates that have lots of exhaust like a steam train. The graphics are definitely two thumbs up! 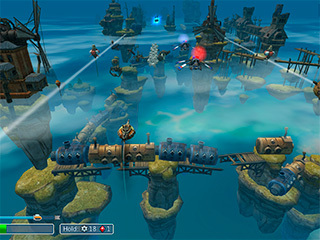 The Story Mode consists of over 20 levels and takes about three hours to play. This one is definitely worth the dollar to buy. There are four different resources that you can collect along the way, and a couple of side missions that you can go on while you are going on the epic story quest. Pick up coins and crystals along the way to upgrade your ship and make those sky pirates shiver in fear as you blast them away! This is Sky to Fly: Faster Than Wind review. Download this game here.